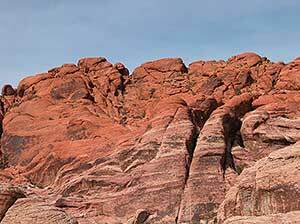 Red Rock Canyon, Nevada is formed from bright red and pink Navajo Sandstone formed from sand dunes during the Jurassic Period. Layering is visible apparent. Sedimentary rocks are formed from pre-existing rocks or pieces of once-living organisms. They form from deposits that accumulate on the Earth's surface. Sedimentary rocks often have distinctive layering or bedding. Sedimentary rocks are classified into three major groups: clastic, biologic and chemical. When sediments consolidate into a cohesive mass, they become sedimentary rock. The composition, texture (how the rock looks) and other features of a sedimentary rock can tell us a story about its origin. Many of the picturesque views of the desert southwest show mesas and arches made of layered sedimentary rock. Clastic sedimentary rocks are the group of rocks most people think of when they think of sedimentary rocks. Clastic sedimentary rocks are made up of pieces (clasts) of pre-existing rocks. Pieces of rock are loosened by weathering, then transported to some basin or depression where sediment is trapped. If the sediment is buried deeply, it becomes compacted and cemented, forming sedimentary rock. Clastic sediments vary widely in size, shape and composition. A single clastic sedimentary rock may be composed of one type of rock and mineral or many types of rocks and minerals. The types of sediment found in a clastic sedimentary rock can tell geologists much about past environments. Clastic sediments and the rocks formed from them are named on the basis of particle size rather than mineral composition. Clastic sedimentary rocks may have particles ranging in size from microscopic silt and clay to huge boulders! The chart to the right shows different particle sizes. Shale is the name given to rock that has mostly clay-sized particles in it. Shale also has the unique property of breaking along flat planes, because the flat clay minerals in the shale separate easily along their flat surfaces. Rock made from silt is called siltstone, and rock made from sand is called sandstone. 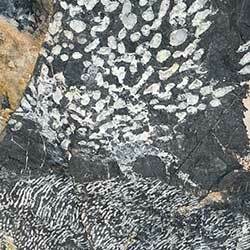 Conglomerate is rock made from varying sized particles that are cemented together by a matrix or mineral cement. Within the limestone rock at Timpanogos Cave deposited around 340 million years are the remains of small marine animals that died, their skeletons settled in the sediments. Under immense heat and pressure, the sediments hardened into rock. Biologic sedimentary rocks form when large numbers of living things die, pile up, and are compressed and cemented to form rock. Accumulated carbon-rich plant material may form coal. Deposits made mostly of small animal shells form kinds of limestone. A common mineral found in ocean water is calcium carbonate. This is the dominate mineral in limestone. Shells rich in calcium carbonate form as animals draw abundant minerals from the ocean water. Dolostone is a limestone that is slightly altered by the addition of magnesium. Dolomite is a calcium-magnesium carbonate. Biologic sedimentary rocks are named based on composition rather than on sediment size. Any rock that contains calcium carbonate reacts with a weak acid. Calcium joins to the acid and carbon dioxide is released, causing the acid to fizz. This reaction is one way to tell a limestone from other rocks. Dolostones react, too, but you need to scratch the surface of the rock, forming a powder, to expose a fresh spot before it reacts with acid. The Heart of Timpanogos is a massive stalactite formed from chemical precipitants over millions of years. Water traveling through rock dissolves minerals and transports them away. Chemical sedimentary rocks form from these minerals. Eventually dissolved minerals are redeposited, or reprecipitate, when the water evaporates or when the solution becomes over-saturated with minerals or when the water enters an area of low pressure, like a cavity in the rock. 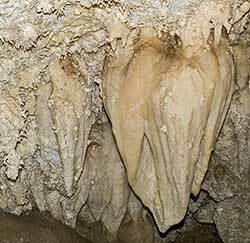 Some chemically precipitated rocks include stalactites and stalagmites you see in caves (also known as travertine). Chert is a precipitated rock from silica-saturated waters. Rock salt, known as table salt, is the result of water evaporating from salt-rich water. How do Sediments Become Sedimentary Rocks? To become a sedimentary rock, sediments must be lithified, or cemented into stone. As sediments pile atop other sediments, the earliest deposits become deeply buried. Weight of overlying sediment places pressure on those below. 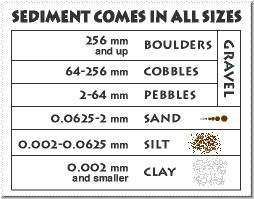 Sediment under pressure compacts. The tighter the sediment is squeezed, the less room there is for water or air between grains and grains to stick together. Something else has to happen to turn these sediments into rock. Cementation is the word given to the sticking together of sediments by additional material between grains. Water flowing between grains contain silica, carbonate or other dissolved materials that precipitate out of solution and attach to grain surfaces. Eventually, enough mineral precipitates out that it cements grains into a whole.